One of the new features on the iPhone 7 and iPhone 7 Plus is the IP67 protection factored into the design, giving the new iPhones dust and water resistance. 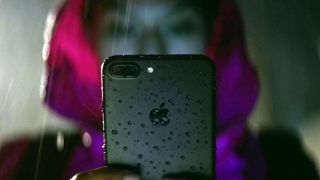 But while they may be water-resistant, neither are water-proof, so you can't expect your smartphone to work after you've dived head-first into the nearest body of open water, iPhone 7 in hand. So what does IP67 mean for you and your new iPhone then? Well IP stands for "Ingress Protection" and the numbers following it refer to the level of protection against dust and water respectively. First up, 6 is the highest rating for dust. That means the iPhone 7 and 7 Plus are totally protected against pocket lint and other associated fine particles. You'll be able to pop down the beach safe in the knowledge your phone won't get sand in any awkward places – although sadly we can't guarantee you won't. The second number, 7, refers to water resistance. While the iPhone 7 duo score highly here, the maximum mark possible is 9, so it's not quite the perfect rating we saw with dust. The general limit for a 7 rating is submergence of up to one meter in freshwater for 30 minutes without harmful water penetration. That means your iPhone 7 should be able to survive a slide into the bath, or a rinse in the shower without issue – but we wouldn't advise prolonged or frequent usage in either scenarios. "iPhone 7 and iPhone 7 Plus are splash, water, and dust resistant and were tested under controlled laboratory conditions with a rating of IP67 under IEC standard 60529. Splash, water, and dust resistance are not permanent conditions and resistance might decrease as a result of normal wear. "Do not attempt to charge a wet iPhone; refer to the user guide for cleaning and drying instructions. Liquid damage not covered under warranty." We've heard it all before, "I don't swim underwater" and "I'm only doing a few lengths", but swimming is a no-no with the iPhone 7. You probably won't want to strap a phone to your arm as your power up and down the pool, but if you do it could spell the end for your new iPhone. While the IP67 rating protects your handset for up to 30 minutes, you'll probably be in the water for longer and even if you're not the pressure of the water as your butterfly up your lane can see the blue stuff forced inside your handset. The fact the IP67 rating relates to freshwater protection should not be ignored. Venture into the sea and the salt water could play havoc with your phone – and that's a risk you don't want to be taking with the most expensive iPhones ever. Don't go too deep for too long. Just don't, your iPhone will hate you for it. As water pressure increases with depth your iPhone won't be able to hold out against the H2O and it'll be sleeping with the fishes in no time at all. We've contacted Apple for more information on what it advises when it comes to the handset's water resistance, and we'll update this article once we hear back.